The brewery group expects that by dispensing with shrink wrapping in its can packs, up to 76 percent of plastic can be saved — in absolute figures this amounts to more than 1,200 tons per year, when fully rolled out. The Carlsberg Group, which usually ranks No. 4 in the listing of biggest beer makers in the world, has set some aggressive sustainability targets for its program Together Towards ZERO. One of those is switching to the packaging solution Nature MultiPack. Snap Pack is an innovative sustainable packaging solution where Carlsberg cans are glued together in a multipack instead of using shrink-wrapping, hi-cone rings or other secondary packaging solutions. The innovation has been invented by KHS subsidiary NMP Systems and developed together with Carlsberg over the past three years. It is now being launched as a world premiere for cans under the name Snap Pack. “One of our company goals is to strive for improvements, and with the launch we clearly show that we continue to live according to our founders’ mentality. Carlsberg’s Snap Pack will significantly reduce the amount of plastic waste and we look forward to offering consumers a better beer experience with less environmental impact,” explained Cees ‘t Hart, CEO of the Carlsberg Group. “Today, good brewing also means protecting the climate, nature and the environment,” explained Simon Boas Hoffmeyer, Sustainability Director at Carlsberg Group. In the run-up to the market launch, the Carlsberg Group invested heavily in market research in order to better understand the wishes and needs of its customers. The result: sustainability is one of the most important purchasing criteria for consumers. Carlsberg then developed its sustainability program Together Towards ZERO. Its objectives include reducing carbon emissions by for example reducing waste and increasing recycling and reuse of materials. The Nature MultiPack perfectly meets this objective. “The Snap Pack offers our customers the opportunity to enjoy a high-quality beer that is also better for the environment,” explained Hoffmeyer. 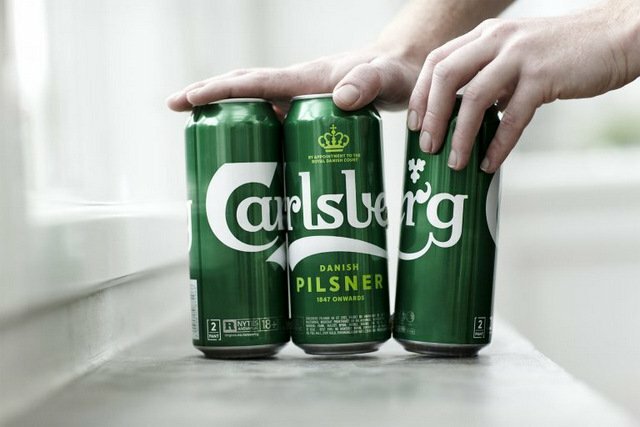 Carlsberg implements Nature MultiPack for cans as four and six packs including the carrying handle and will begin selling it in the United Kingdom and Norway with Denmark, Carlsberg’s home country, following in early 2019. The market launch was preceded by an intensive research and development phase. A particular challenge was the composition of the adhesive which bonds the filled cans with only a few adhesive dots to create a stable pack. The many hours of development have ensured that the individual cans can easily be separated with a single movement. “We have succeeded in developing an adhesive that works without damaging the printing ink and lacquer on the can,” said von Aichinger. I met a craft brewery rep in Toronto today who use to work for Carlsberg in Canada. At one time Carlsberg was domestically brewed here by both Labatt’s and Moosehead. A few years ago that licensing stopped. No advertising now, nothing, no POS. This is a beer that now has zero presence here. Just another foreign beer on the shelf. Sad.